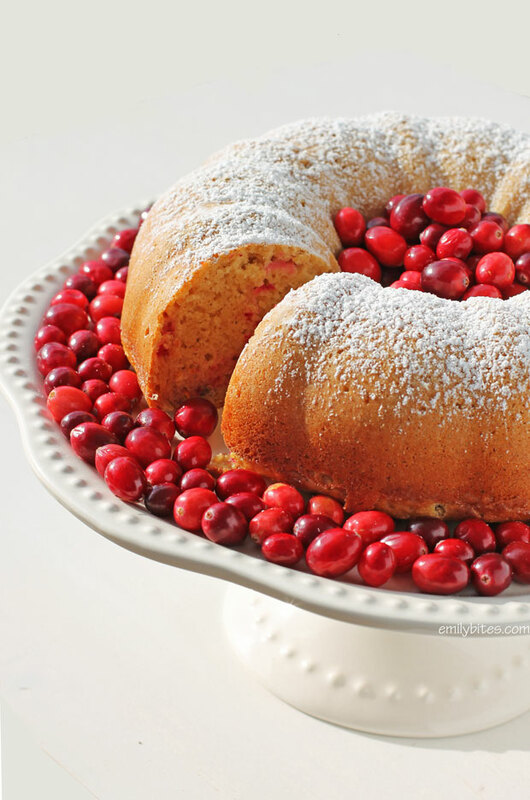 This Orange Cranberry Bundt Cake is the perfect Winter cake or holiday dessert. Not only is it beautiful, but it is oh-so-delicious. The cake is full of light citrus flavor and the bursts of tart cranberries are the perfect complement. I chose to dust the cake with powdered sugar rather than make an icing, and for me it was perfectly sweet. Replacing the oil with flavored Greek yogurt kept the cake light and also allowed me to use less sugar. No one will know the difference! 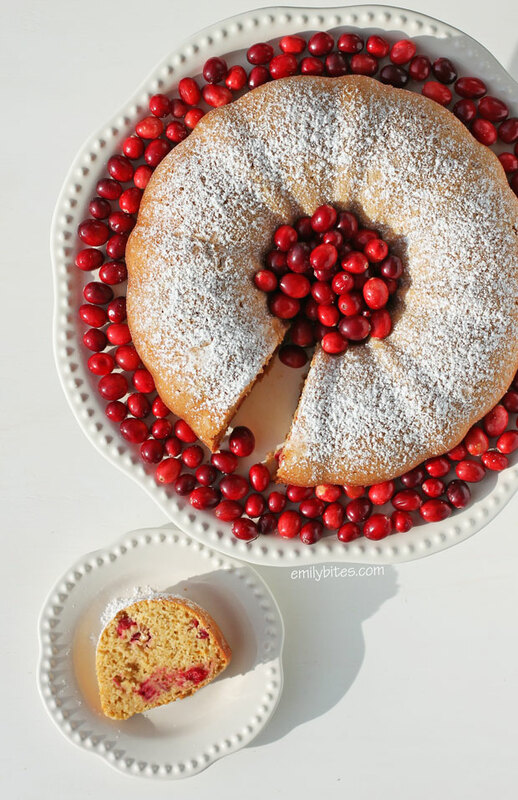 I’ve always loved the orange-cranberry flavor combination, and as soon as we received a bundt pan from our wedding registry I knew this was what I wanted to make first. This cake comes together very quickly and it’s a great way to impress your guests for the holidays or surprise your family with a sweet treat for dessert. Preheat the oven to 350. Coat a bundt pan with cooking spray and dust with a tablespoon of the flour. In a large mixing bowl, combine the remaining 3 cups of flour with the sugar, baking powder, baking soda and salt. Stir to combine. In a separate mixing bowl, whisk the eggs and egg whites together until beaten. Add the buttermilk, yogurt, orange juice, zest and vanilla and whisk together until well combined. Stir in cranberries and then add the bowl of wet ingredients to the bowl of dry ingredients. Stir together until flour is mixed in and a batter forms. Pour the batter evenly into the prepared bundt pan. Bake for 45 minutes or until a toothpick inserted comes out clean. Invert the pan over a cooling rack (I placed a cutting mat under the rack to catch the powdered sugar) so that the cake slides out onto the rack. Dust the powdered sugar over the top of the cake and serve. Ok, this looks delicious and as Lauren mentioned is really pretty too. I’ll definitely need to make this! Would this work as muffins? Sounds yummy! Do you think there would be enough flavor if I use plain Greek yogurt? Or would the flavor change be too much if I use honey-flavored? We buy our yogurt at the farmer’s market, and they don’t have lemon or orange-flavored. It’s hard for me to say since I haven’t made it that way, but the honey flavored would probably be yummy! Some of the sweetness in the cake comes from the yogurt, so I wouldn’t use plain. I made this cake today and it tasted okay but the texture was too spongy for me. The birds will love it tomorrow. Sorry to hear you didn’t love it. Hopefully the birds will enjoy! This looks so yummy! Cranberries are so pretty and Christmas-y. Very nice photographs too! This looks good and so pretty! I’m making this tomorrow, but I’ll have to use vanilla greek yogurt because after looking at all three grocery stores in my little town, I couldn’t find any citrus flavor. Hopefully the vanilla won’t change the flavor too much. I’ll add an some extra zest and juice to up the orange factor a little. Can’t wait to try it! can this recipe be made with splenda in lieu of sugar? if so, what would the freestyle points be.